"Welcome home" is how you are greeted upon arriving in the stunning lobby of the eco friendly Dreams Resort & Spa in Tulum, Mexico part of the Mayan Riviera. I know this because I was fortunate enough to be invited to an Influencer Getaway (AKA Girls Trip!) with team Mom Trends and a curated bunch of the most amazing woman influencers around (Girl Power to it's finest!) to test drive some amazing swimwear, soak up the sun and enjoy all that this family friendly all-inclusive resort has to offer. Not only geared toward the kids, this resort makes everyone feel welcome from honeymoon suites to live outdoor music to relaxing yoga on the beach. I'll be sharing all the deets from this exciting trip and exactly why I will return! If you follow my social media, you have seen a glimpse of the fun! So, I'll be sharing all the details here and WARNING: this may make you all want to book your tickets, like tonight! 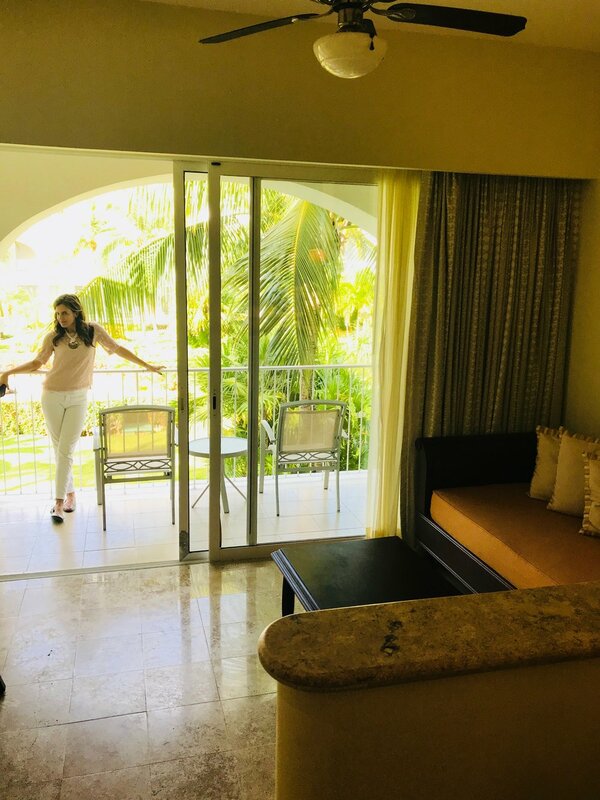 So read on if you are ready for a trip to paradise... Because Dreams Resort & Spa was just what I needed after this winter and I am sure you can all relate. Hola, paradise is calling! Lets just say I answered this call loud and clear. It's not often a mom of three gets to take a girls trip and when this opportunity came up to visit the breathtaking Dreams Resort in Tulum, Mexico, I had no choice but to accept. This has been a long winter, period. Anyone on the East Coast can vouch for that. It's now almost May and we are still in winter coats in NYC. So, needless to say I grabbed a few of my favorite swimsuits, a chic little boho hat, my passport and hailed the closest taxi with a few of the other woman influencers and off we went! Arriving in Mexico gave me life. Feeling the warm breeze as we walked through the spectacular grand lobby to the balcony overlooking stunning views of the property. With ocean views in the distance and a beautifully landscaped garden pathway leading you straight to the main pool located on a private stretch of the Caribbean Sea. This award winning resort has unlimited modern affordable luxury because everything is included. Score!! We checked in and I was escorted to my very own Garden View Suite with balcony. They offer many options in their 432 room resort. Even featuring an adults only section with private pool. I may not have needed all this extra space for this trip but I wasn't complaining. Plus, now I know we can come back with the whole family. Dreams Resort welcomed us with a spectacular surf and turf dinner at the Seaside Grill roof terrace. The all inclusive resort features 9 dining options throughout the property. With international cuisine and 6 a-la-carte options, a buffet, a grill, a cafe' and a swim up bar called the Manatees. Not to mention the 7 bars and 24 hour room service. Did I forget to mention no reservations needed?!! We ate, we sipped margaritas and watched the sun go down. It was so lovely catching up with some of the ladies and also meet and chat with some of the influencers I haven't met before. Getting into the vibes of the resort was so relaxing and it set the tone for the rest of our stay. Which started the next morning with the delicious green juice and buffet breakfast at the El Patio restauant. It wasn't long before we all landed poolside for some sun and relaxation. Did I mention picture perfect frozen tropical cocktails? Well, yea there were tons of those too! There are two pools, one is the main pool with the show stopping white stucco bridge and that vacation must have swim-up bar adorned with 4 adult size swings! But we opted for the pristine deep blue jewel toned tile pool with private cabanas. After lunch we headed to the Preferred Club Beach for a little dip in the ocean. Learn more about what the Perferred Club has to offer. After this much needed downtime I opted for a little walk around the property. I just love exploring and seeing everything that the resort has to offer. I checked out the numerous gift shops, the kids club and teen club and as I wondered back toward the main area of the resort I stubbled upon a life-size chess board nestled in the garden. Which lead me back toward the main area of the resort where a bunch of fellow beach goers were gathering around a small stone dome hut to experience a Mayan Cleansing Ritual. My day didn't end here, all the influencers and I gathered later that evening for a magical night of tequila tasting, local market shopping, live music and the evening ended with a live aquatic dance perfomance. It was truly memorable. Trying to soak up every second we woke up early the next morning to enjoy our final day. We squeezed everything we could into our relaxing stay but here is why I will return! Yes, my husband and I have been discussing a family trip here in December! 1. Affordable Luxury - No matter who you are traveling with, this resort has thought of it all and won't blow your budget. With an adults only section to family friendly suites and with affordable room rates, fast and easy food options not to mention two main pools just yards from the beautiful sandy beach, makes it easy for anyone to enjoy. Check out the picture of my suite which had a king size bed, step down to this lounge area as well as a beautiful private deck. For larger families they offer a recently renovated Hacienda Suite. Dreams Resort & Spa Tulum. 2. Unique & Memorable Experiences- Dreams offers fun and unique one-of-a-kind experiences like tequila tastings and nighttime Mexican market in the main area of the hotel for some local shopping. Live evening performances featuring aquatic water and fire dances. The fun is endless and can accommodate all your need whether exclusive & romantic to fun for the whole family! Inquire for more details. Here Megan Zietz and I are having fun with a giant sombrero! Find out more about their activities and entertainment. 3. Location- Tulum is such a popular place to visit for a reason. Dreams is just minutes from the Mayan Ruins and must see boho town. So much to do and see. I can't wait to check out the local Cenote Tour. All excursions can be booked with the resorts' concierge. Click here for tours and excursion details. 4. Mayan Rituals- Experience the culture with the mystical TEMAZCAL an herbal steam bath. This spiritual ritual is lead by a shaman or healer. It's believed to heal ailments and improve your health. I could definitely use that! Here is the hut where the ritual takes place every Thursday evening at 5pm. Scroll down for all the info and details. 5. Kids Club & Teen Club- The Explorer's Club is for ages 3-12 year olds who want to enjoy a little time off the sandy beach for some exciting water slides, rock climbing wall, trampoline and tons of crafts. This is included in the Ultimate Luxury package and parents can be contacted with complimentary cellphones or pagers. I know my kids would love this place! Situated off the beaten path in what I like to call it's own little jungle. For older kids they have the Core Zone Teen Club with supervised activities. A place to meet new friends and enjoy sports and games and nightly social events. Here is picture of the water structure in the Explorer Club with shaded tables for eating and creating. Explorer's Club & Teen Club. 6. Spa- You all know I love to make my own anything and this spa has a place to make your own spa products from local Mayan plants and herbs. Then bring it back to your outdoor palapa for a relaxing massage or scrub. They offer couples massages, facials and body treatments. As well as a kiddie spa with strawberry facials and chocolate body wraps. My daughter would love that! Dreams Resort World Class Spa. 7. Private Dinner- A dinner to remember on the Sunset Terrace can be arrange at an extra fee. Perfect for more of a private dining experience. Watch as the sun goes down while enjoying the tropical breeze in elegance. They offer many private dining options like dinner on the beach to making your own cocktail mixing class and even a private dining experience in your suite! They even have romantic spots too... Just ask and they have a option that you and your guests will absolutely love. Vacations are all about making memories and experiencing special evenings like this. Check out this view! Dining at Dreams Tulum. 8. Luxury Options- Upgrade your stay with Preferred Club a higher level of luxury. With upgraded suits, access to a private lounge and beach section. With tons of extra enhanced amenities. Here Lara is enjoying the private beach area with it's own bar and concierge team. Also, the shady cabanas are a must for anyone looking to have relief from the sun. Click here and scroll down for all the info. 9. Water Sports & Activities- Yoga on the beach to chartering your own boat for the day, they have it all. I can't wait to check out the snorkeling next time we are there and I have always wanted to try paddle boarding. I know the boys will want a fishing day and if you visit July- December you can watch the baby sea turtles hatch and take their first steps into the water. Check out the girls on a kayak! For more info about these activities and more. 10. Convenience & Ease- Meals are easy, pools & beach location are just steps from your room. Also, included is a jungle gym on the beach adjacent to the main pool and Barefoot Grill. Talk about convience! This makes a mom's life so much easier! Maybe making time for that much deserved tropical cocktail?! Below is the swim up Manatee Bar. Did I mention they have adult size swings?! How fun... Click here to explore more! Paradise awaits! Don't wait check out DreamsResorts.com... Your trip is calling you! It is officially Spring and that means Summer is right around the corner. The topic all my mom friends are talking about is what they'll be doing this Summer. That's why I've partnered up with Suburban Jungle to help you figure out what type of Summer rental is right for you and your family. Don't get overwhelmed by all your choices, we will help you narrow down how to find the best locations for you, based on your personality! Not sure if you are looking for a destination that is quiet and serine OR a location with a booming social scene? Find out how to choose a place that is right for you! Let The Summer Search Begin! If there’s one thing Suburban Jungle wants city families to know it’s this: EVERY town has a unique personality—and understanding that personality is VERY important to your suburban search. The happiest urban-to-suburban families are the ones who find the right town—the town that syncs with their lifestyle, their wants, their needs and their expectations from day one. The better the connection, the better the transition and every single day after will be. It’s that simple. At this time of year, though, that personality-first conversation starts to take a slightly different twist. Many city families are gearing up for summer—and, for many, that means putting down roots in a new community outside of city limits. Some opt for go-to summer rentals—the Hamptons, Fire Island and other escapes. Other families, though, choose to test drive a suburb during the summer, getting acclimated while experiencing what “real” life would be—they commute to and from the city, enroll their kids in area activities and camps, and, overall, live like a local for a few months. And after that? Maybe they head back to the city, or maybe they pack it all up and make suburbia their new home. Thinking the Hamptons, Nantucket, Jersey Shore or some other summer hotspot? Remember, even popular summer rental towns have major personalities. Your job? Find one that aligns with your family. In the Hamptons, for example, Montauk is nothing like East Hampton, which is nothing like Southampton, Bridgehampton, Sag Harbor, Watermill or Sagaponack. Each are different, but how do you figure out the true intangibles and differences?! No one town is better than the others—it, again, all comes down to your family, your lifestyle and your expectations for the summer and beyond. It’s similar to exploring suburbia, but summer rentals tend to go in a slightly different direction since some of the amenities and activities you’ll want access to may be purely seasonal. But, still, it’s important to really understand the personality and culture of a community. Will you show up in your summer rental town and find out all the kids are at sleepaway camp? Or does the vacation town you picked have a lot of full-year residents, who flee for the summer? Do young children go to day camp in the area, or is it a bus ride away? What about weekends? All of this goes into a town’s personality—and all of this is important to you and your family having an amazing summer. Testing out a town for a potential move? In the New York City suburbs, towns like Rye, Pound Ridge, Bedford, Greenwich and Westport are popular for summertime test runs. Many families find rentals in these communities and, again, live like a local—commuting, exploring, joining activities, sending kids to camp and, overall, getting their feet wet before diving in head first. It’s a great approach if your family can manage it, but it’s also important to dig into the town’s personality before plunking down for the season. If you opt for this route, be sure you do your homework on the town’s summer personality now. Again, are all of the kids at a local or out-of-town day camp—and, if so, can you register your child for this summer so they’re in the mix? Do older kids go to sleepaway camp—and, if so, where? Are families home and hanging by their pools? Out of town? At pool clubs, beach clubs or country clubs? Somewhere else doing something else? Find out all you can so can ensure the town aligns with your wants and needs, in the summer and in the cooler months. Summer is a great time to relax and enjoy suburbia with your family. But, like any other time of the year, make sure the vacation town or the maybe-forever town you choose syncs with your crew’s personality and lifestyle. You’ll be glad you did, whether it’s summer or not. The Suburban Jungle is an award-winning firm that specializes in moving families from urban to suburban. The company’s innovative “town first” approach helps buyers find the right suburb for their family based on personality and lifestyle, not just the house. Services are FREE and fully customized to each family and their unique journey. To learn more and to connect with a Suburbs Strategist, and find the place your family truly fits in visit www.suburbanjunglerealty.com and click GET STARTED. However, I don't want them, or myself, to miss out on having a great time this winter! So, we decided to take a fun staycation, right at home, with our indoor camping night! I borrowed a tent from our neighbors and laid out a soft cozy blanket. But, the best part was suppling the kids with all the fun camping gear that we'd use on a real camping trip, like lanterns and of course, s'mores! Check out how we created this fun and memorable night, right at home! No details were missed as I transformed our living room into a kids camping oasis. They started the night by getting comfortable in these adorable matching pajamas by JM Cremp's. The fun and playful design really helped get the kids in the mood for a fun family adventure. Then we tried out the super kid friendly baking kit by Yummy Nummies. Followed by some, dim, night-time bedtime stories around the campfire. Try books like Curious George Goes Camping. Or, for more authenticity, try the Kids Campfire Book- Official to learn real camping skills. For older campers, suggest that everyone go around the campfire and tell a spooky story! Nothing says camping more than the smell of marshmallow over the fire. So for the real effect and to really set the mood, as the evening went on, we roasted actual marshmallows on this indoor Nostalgic S'mores kit. We bought these adorable pre packaged boxes from Smorbox. And let me tell you, the looks on their faces was priceless. Another great time to surprise the kids with this fun activity, is on a cold winter day. Maybe your little ones are stuck inside during a snowstorm or not feeling up to going out for a planned winter activity. Surprise them with a little at home day of fun and excitement that is sure to impress! It's not just the marshmallows and chocolate that makes this so much fun but it's the whimsy and fairytale of camping that you will all enjoy. Check out how their cousins, Oliver and Max, in Westchester, NY decided to get in on the action. While, my nephew was home recovering from being sick and missed out on a super fun day on the local ski slopes with his buddies, my sister in-law, Lauren, decided to share this same idea and look at all the fun they had! Such a great and memorable way to spend the day indoors. They even added their own walkie-talkies! It's September and that means it's apple picking season! My family and I love to go apple picking every year and it truly does mark the beginning of the fall season for us. We love going to orchards and buying all the festive apple goodies like hot apple cider, apple cider donuts and of course my favorite, carmel apples! And the kids love the hunt to find all the best apples that the orchard has... running from tree to tree and always spotting one on the highest branches. Warwick, NY has the best orchards around. Many are as close as an hour to an hour and a half north of Manhattan (depending if you are leaving from uptown vs. downtown Manhattan). So you can definitely make it a day trip. Warwick is also home to Applefest and if you've never been, then you are missing out. It's a day where they shut down all the streets in downtown Warwick and host a huge celebration of shops, face painting, amazing food and drink... not to mention tons of quintessential apple delicacies. A few months ago my husband I were invited to a super chic destination wedding in Tulum, Mexico. I knew that if I didn't go that my husband would still go and then Id be home missing out on all the fun. Except I wondered how I would manage this trip with my three children. Brycen is 7, Brinkley is 5 and the baby would only be just turing 7 months at the time of the wedding. I knew I could make it work but it wasn't going to be easy. First I focused on what we'd ALL need for the trip and I started packing (yes, a month early). I grabbed the suit cases from the storage locker and layed one out for the two older kids and one for the baby. *Id have to figure out where all my things would go later..
First I went through all the kids clothing from last summer and took out what I knew would still work for this summer. The baby would need an entire new summer wardrobe but I knew the other kids would have some things that would still fit. Then I took note of what I would need to get. Thinking about the day to day at the hotel it occurred to me that the baby spent a lot of time in his 4 Moms Momaroo. So I knew I needed to find something he could sit in or even nap in while we were away. I wound up bringing the vibrating chair that came with our Pack n' Play. It has a thin metal frame and thin nylon seat so I could easily pack it in the large suitcase and jam all the rest of the baby things around it. Disposable Baby Bottles - I didn't learn this until I was there slaving away at the hotel sink all day sanitizing the baby bottles. Its totally worth buying these bottles http://steribottle.com and then tossing them. It will help save time and avoid the baby from the possibility of the drinking any contaminated water. However, try them before you go to make sure your baby will take them ok.
All Toiletries - its not as easy as you'd think to get things while you are away. I figured I'd get some things like diapers and things if I needed them but it was quite difficult depending on how exotic of a place you are going. Kids Dependable Snacks - (i.e. gold fish, cereal bars and things they normally snack on at home). Mexico had amazing food but the kids found it hard to snack on their unique items. Carry On Bags - Each child (including the baby) had their own carry on bag. I packed some small toys and electronics as well as snacks in the big kids. The babies bag had plenty of formula and bottles and a couple of organic baby food pouches (Brent LOVES Gerber and Ella's Organics). As well as the ERGO carrier and some small toys and pacifiers. After all the well thought out packing we set out on our excursion. The trip was short and sweet since we live in NYC and Mexico is only about a 3.5-4 hour flight. We flew into the Cancun airport but the hotel was about another hour from the airport in gorgeous Tulum. The hotel driver picked us up and I was so happy they had car seats all set for all the kids! The trip went by fairly quick as the kids enjoyed looking at all the new seniority and the baby got a quick undisturbed nap. Upon arriving, the hotel was serine and simple. It was gorgeous and exactly what we all needed. Our villa wasn't huge. Its the largest of the one bedrooms but its a one bedroom. Its basically a large open space with a tv/lounge room that leads to the deck and then small staircase that leads up to the bed and bathroom. There was also a large bathroom in the main entry hall which was a great bonus since we have so many people who need to shower and get ready. The baby slept in a crib that they provided. The staff was incrediblly helpful with getting the room prepared for the baby and the older kids. They had the lounge area set up for sleeping for the two older children. They knew how many children we had and ages as they reached out to me via email when booking and communicated a lot with me prior to the trip to make sure our needs were met. And our needs were definitley met. They stocked the room with beach toys, baby supplies and even helped me get settled in. The stay was amazing. The only issue I had was cleaning the baby bottles. I was so nervous the baby would drink the water and get a stomach bug so I used only bottled water. The hotel had a water boiler for me also which I used to make warm bottles but also to sanitize the bottles before use. I spent much of the trip cleaning bottles. We spend most of this trip socializing with other wedding goers. The kids enjoyed the beach, the ease of life and the food. My husband and I loved the small town of Tulum. This hotel is about 30 +min from the area we went out to dinner in. But its worth the trip. The food and nightlife are amazing. The restaurants are all outdoors with sting lights enchanting every corner of the fabulous beach side town. We returned the following day with the kids to do a little sight seeing and shopping. We weren't disappointed. There was something for everyone. Although you could easily walk the entire lenght of the town in an hour.. the shops are interesting and the merchandise is high end. Even for a new yorkers taste. Don't expect to find the cheap Mexican trinkets here. Tulum is filled with expensive local artist work and specialty shops like Coquie Coquie an amazing perfumier on the beach that also sells high end clothing and accessories. I have heard you can also stay as there is a tiny resort attached. Sounds super exclusive! Our stay at Esencia drew to a close but up next was the all amazing and glorious Banyan Tree Mayakoba. I've mentioned Banyan Tree to some NY people and they've only had amazing reviews. The initial take for me and the kids wasn't great since our villa (gigantic 3 bedrooms with pool villa) was far from the beach. But we settled in and really enjoyed everything Banyan Tree has to offer... Its a different vibe from Esencia since its a huge resort and you get around the via a small trolly/golf cart. However, if you aren't traveling with kids or just happen to be alone for a few hours the hotel does provide two adult bikes that are parked outside your door for use at any time. The food was great and there are numerous restaurants to choose from. Don't try walking to the beach from the villa as I did and ran into the local monkey. I wasn't aware of these monkeys and though i was being attached by a raccoon (they look very similar.. or at least I thought so)!! The Mayan dinner is a MUST. I have no idea how expensive it was but it was worth the splurge. The children loved the theatrics and my husband and I really loved the food and drink tasting. *This is set up by appointment only. If you don't know what the DR is don't worry. I didn't realize the Dominican Republic was abbreviate to DR until we were planning our last family vacation. We love going away in the summer and this summer was no exception. Our friends live there all summer but during the school year they are in Manhattan. We decided to visit them for a few days and then stay at our own place for another week. Our first stop was Casa De Campo. It was amazing having the kids staying all under one roof. I guess it's not that different than all living in the same high rise building but being in a different country. Casa De Campo has everything you could ever wish or dream for. Beautiful beach, delicious restaurants and some novelty shopping. Its very exclusive and vast. You will need to have a golf cart or car to get around the property. This place is gorgeous. The home we stayed at was beyond beautiful. Although unique in it's architecture (the entry way had no front door and the upstairs was totally accessible from the outside *risky in general but super scary with kids) the stunning home we stayed at created so many amazing memories that I know we will all have forever. I may have slept with one eye open the entire time but we felt so isolated and relaxed this trip! The weather was very hot as it should be in the Dominican in the summer. But we had an amazing pool and managed to escape the heat as much as possible. Check out some of my favorite pictures from the trip!